Current and proposed location of Harriet Tubman Women’s Shelter on DC General Campus. Diagram from DC Office of Planning’s prehearing statement. The DC Department of General Services needs to move residents out of the current Harriet Tubman Women’s Shelter in DC General’s Building 9 to Building 27. Why? The city has determined that Building 9 is in extremely poor condition and poses potential safety and health hazards, particularly in the unoccupied areas of the building (only 10 percent of the large building is currently used for the shelter). Building 27, which used to house the offices of the city’s chief medical examiner, has been recently renovated and abated. DGS plans to temporarily house up to 100 women in the portion of Building 27 previously used as office space. DCist has a nice recap of the May 8 community meeting where DGS outlined the relocation plans. Before DGS can begin the process of moving the shelter, the city needs to seek zoning relief to allow the move to happen. 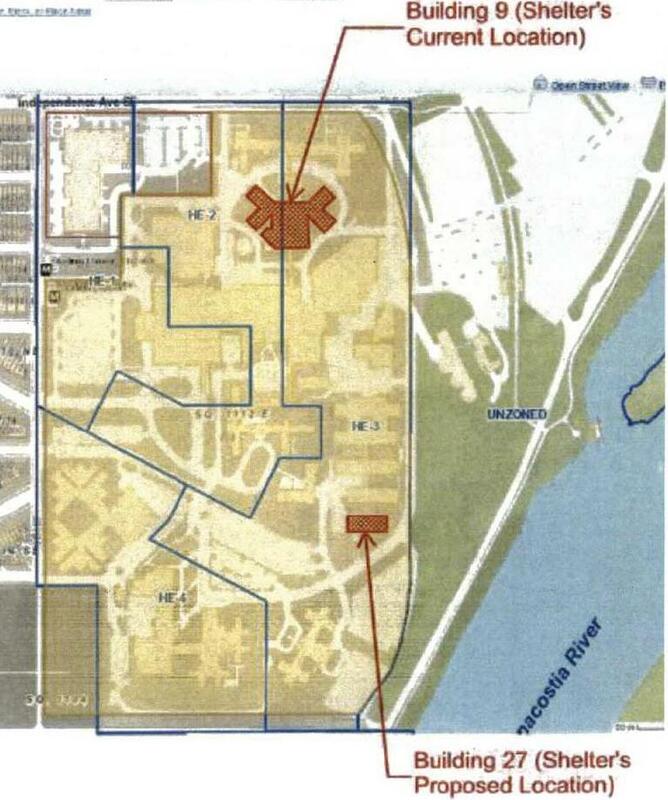 The DC General campus is located on Reservation 13, a site with zoning for mixed-use development consistent with the city-approved Reservation 13 master plan. The existing shelter uses on the site – the women’s shelter and the emergency family shelter in the core building – are not permitted under the site’s Hill East District zoning but were grandfathered in when the zoning was approved in 2009. At the request of DGS, the DC Office of Planning is seeking a text amendment (pdf) to the Hill East District that would allow for a temporary emergency shelter serving up to 100 residents at either Building 9 or Building 27 but not both. OP argues that the text amendment would allow the relocation to happen while ensuring that the shelter use is limited to one building or the other. The Zoning Commission will consider OP’s text amendment request during a June 5 hearing. The Zoning Commission already approved the requested change on emergency basis set to expire in July. The problem with OP’s text amendment is that it permanently changes the Hill East District zoning, potentially allowing an inconsistent use to exist in Building 9 or Building 27 in perpetuity. Why does the city need to permanently change the Hill East District zoning for a temporary relocation? Fortunately, the Hill East District zoning already includes a process by which the city or any applicant can seek a special exception to temporarily allow a use that is inconsistent with the zoning. In our letter to the Zoning Commission (pdf), ANC 6B outlines two options the city can use to seek the zoning relief needed through the special exception process. We also argue that any ruling should make it clear that the women’s shelter should not be permitted to move back to Building 9 and that the deteriorating, unsafe building should be demolished (DGS has stated publicly that they have no plans to renovate the building). Of course, I’d prefer that the city have an actual plan to find better, safer housing options for residents of both the women’s shelter and the temporary emergency family shelter at DC General. Unfortunately, temporary uses tend to turn into permanent uses at Reservation 13, which makes it all the more critical that any zoning changes are temporary and not permanent. You are currently browsing the archives for the Reservation 13/Hill East Waterfront category.